Celery would never be added to a list of the top five most popular vegetables. In fact, many find this stringy, crunchy stalk to be downright nasty. However, all of the hate for celery is certainly not justified, as it has actually been shown to have incredible health benefits that can help reduce inflammation, improve digestion, and so much more. This green vegetable is a common addition to cuisine around the world and with good reason! Part of the Apiaceae family, celery is thought to have originated in the Mediterranian or North African region, but its popularity has spread, and it is now used in soups, sandwiches, or covered with peanut butter for a simple snack. 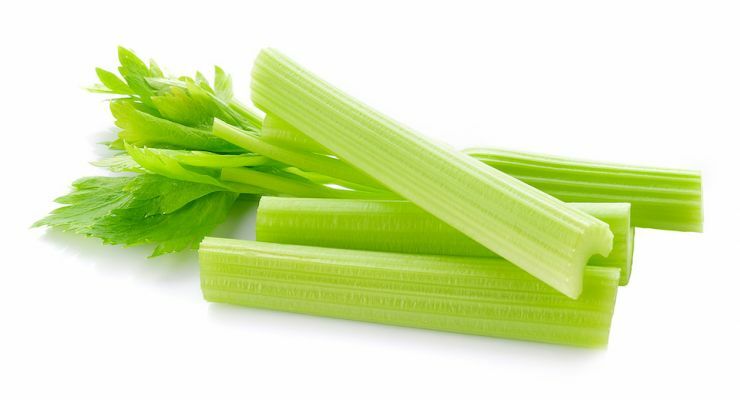 Listing all of the nutrition facts for celery would take some time, as it is one of the healthiest vegetables, packed with loads of minerals and vitamins. It has high levels of calcium, sodium, copper, magnesium, iron, zinc, and potassium along with important fatty acids. Celery has also been shown to be rich in vitamins such as vitamin A, K, C, E, D, and the B vitamins (thiamin, riboflavin, folic acid, vitamin B6, and vitamin B12). Plus, don’t even get me started on its fiber content! If you find yourself craving a crunchy snack, instead of grabbing that bag of potato chips, try reaching for a nice stalk of celery. It is incredibly filling and yet low in calories, which means that it is an excellent snack option for those seeking to lose weight and stay full. Sometimes it can be hard to remember to keep yourself properly hydrated. It is often easier to snack throughout the day than to sip. Celery is actually 95% water, so it can help keep your body at a healthy hydration level. The perils of chronic inflammation have long been understood; however, sometimes it is hard to discover easy ways to help reduce that inflammation. Celery may be the answer you’re looking for, as it is effective at reducing inflammation related to cardiovascular disease and even cancer. Celery is loaded with Vitamin A which can help improve eye health, treat dry eyes and prevent infection. A study published in the Journal of Agricultural and Food Chemistry shows that celery may be helpful in reducing bad cholesterol levels in the body. The fiber in this vegetable works to scrape the cholesterol out of the bloodstream and stimulate the secretion of bile juices. Celery contains helpful phthalides, which are organic compounds that can help reduce the level of stress hormone in your body; thereby helping to return blood pressure to a normal level. Plus, it contains potassium as well, a known vasodilator which can cause your veins to expand and decrease blood pressure. Because celery is high in vitamin C, B, and A and iron and has potent diuretic properties, it is an effective way to cleanse the liver and prevent liver disease and infection. Clearly, celery is worth adding to your daily diet, but plain stalks can often be unexciting and not exactly desirable. Try these tricks to help develop your love of this green, health powerhouse. When you are searing for that midnight snack, be sure that your celery is in view and easily accessible. Simply having it in your house will make you more likely to consume this powerful vegetable. If you enjoy almond butter or natural peanut butter, spread a little on top of your celery for a protein-filled treat that is sure to keep you going through that mid-afternoon slump. To mix it up a little, and give you an added natural sugar boost, you can even try adding raisins or dried cranberries on top. Celery can be enjoyed with virtually any kind of hummus, from homemade to garlic or roasted red pepper. Even if the recipe doesn’t call for it, celery usually does well in most soups. Add it to your next batch to help increase the flavor, add a little crunch, and help expand the portion sizes for a more filling meal. Hey Buddy!, I found this information for you: "7 Things Celery Can Do For Your Health". Here is the website link: https://www.tropicalhealth.com/things-celery-can-do-health/. Thank you.